I’ve never been much of an ice skater, but used to roller skate years ago quite a bit, and memories from childhood mostly, skating with flimsy leather skates, have effectively kept me off the ice rinks ever since. Few years ago I did had to jump back on it, to enjoy this dreaded sport with my daughter. Back on ice, but not thrilled about it, I thought Nordic skating could be fun. 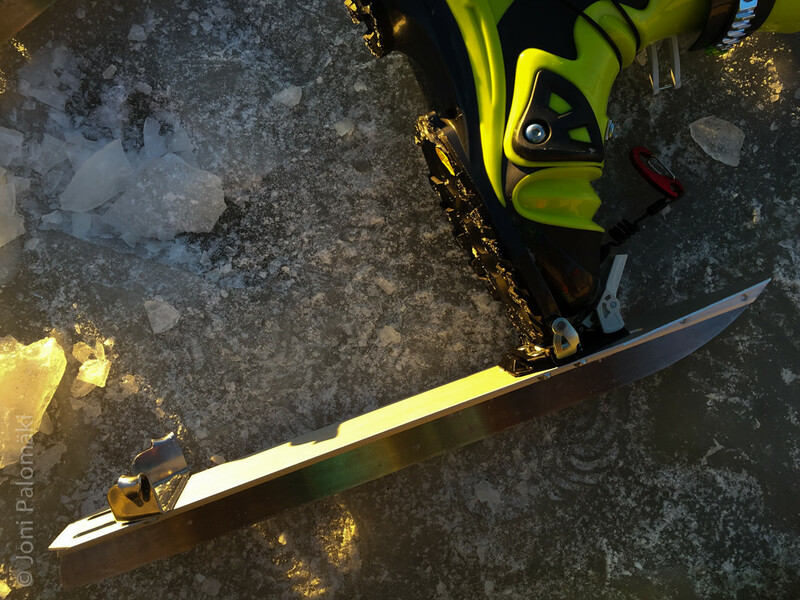 But few short tests with different boots, such as ones for cross-country skiing and ice climbing, left me wanting for more support. Having a size 46 foot, but narrow and loose ankles is not an optimal combination for a sport that demands control and strength on lower legs, and well-fitting, supporting shoes have been hard to come by. 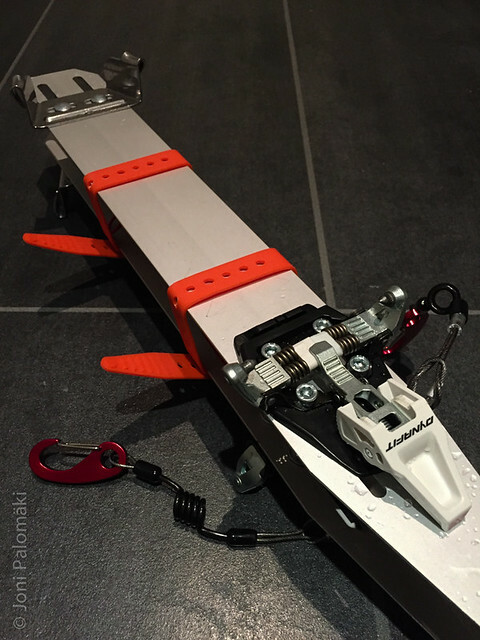 I had played around with an idea to use my telemark boots for ultimate control, but having switched from the old norm to NTN, could not make myself to invest into another pair of Rottefella Freeride/Freedom’s just to try if it would work, and generic bindings did not seem like a good fit. I was also concerned if the mere weight of the plastic boots would be an issue for skating. Last winter I read about some of the amazing tours Luc Mehl had done in Alaska, and noticed he was using his Dynafit boots and bindings also with skates. Come this winter, encouraged, I decided I would try to work something out, and finding a great deal on pair of Skyllermarks Möja skate/binding combo at Bear & Water, I was ready for a trial when the first snow fell. Per recommendation from Bear & Water, I got myself relatively long, 53 cm, skates. Möja binding is a good fit for the old norm telemark boots, but can be adjusted to work with any boot with some kind of lip up front, or to a normal hiking boot with additional arch on top of the toe piece. Putting them on, front of the boot is slid under the toe piece and heel is locked in place on the heel cup with strap. 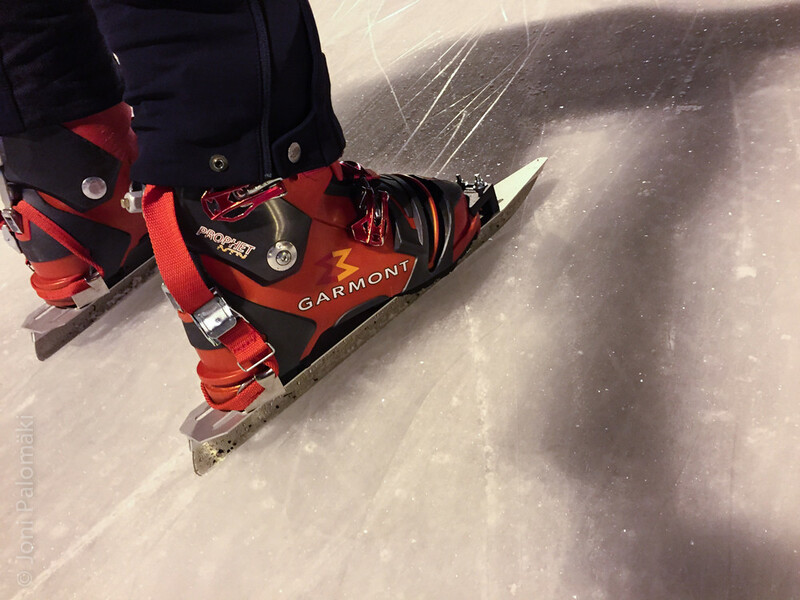 I tested this setup for the first time on my old pair of Garmont Prophets NTNs, on the local outdoor ice rink. While binding worked in principle, solid plastic boot with upwards arching sole put quite a lot of stress on the toe piece (which bent slightly), made of some sort of plastic composite, and skating few kilometers around the rink I could notice the strap did not perfectly hold the heel in place, allowing boot to shift lightly. 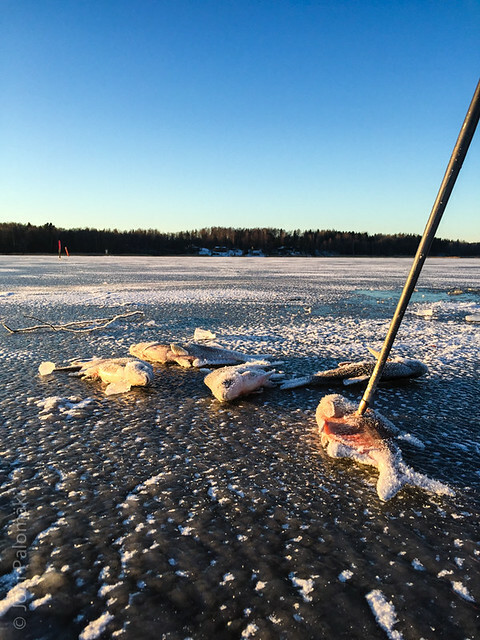 Once it loosened up until the skate came off - not a pleasant thing to happen at speed, I tell you that. 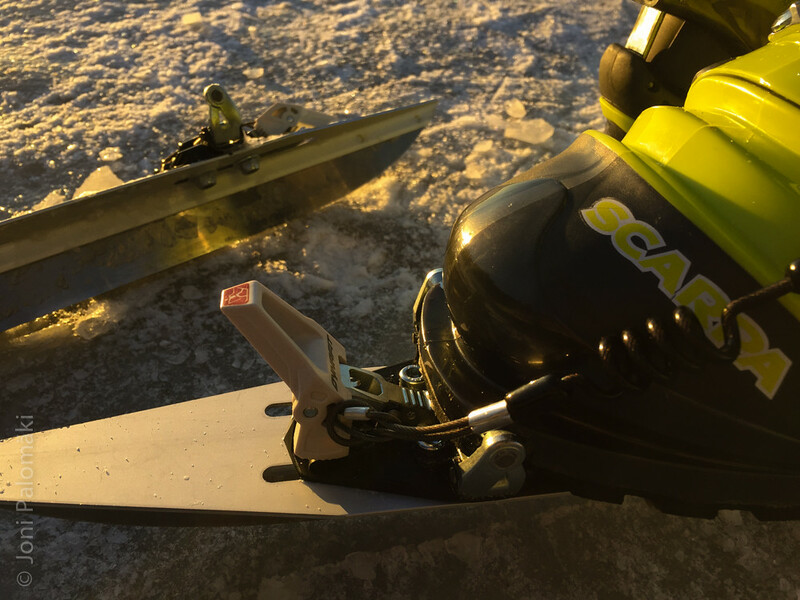 Instead of running the strap over the boot, I also tried to route it through the walk/ski locking mechanism on the back of the boot. Better, but heel still not stay perfectly in place and left me wondering if the skate could again come off too easily, due to the small front lip on NTN boots (as opposed to more generous duckbills on the old norm boots). As I was midst replacing my telemark boots with slimmer model (Prophets were always a bit too wide for me, but since I got them super cheap few years back, I stuck with them merrily until this winter), Garmonts were soon gone, and my new boots from Scarpa, Terminator X, sported Dynafit inserts. I looked at the different types and versions of Dynafit compatible bindings, and put up a want-to-buy add on Relaa.com marketplace, for a pair of any Dynafit toe pieces. Dynafit-compatible bindings are quite common, and relatively easy to find also second hand. Heel pieces not required, you might want to optimize the cost, and get just the toe pieces from The Ski Mountaineering Company. 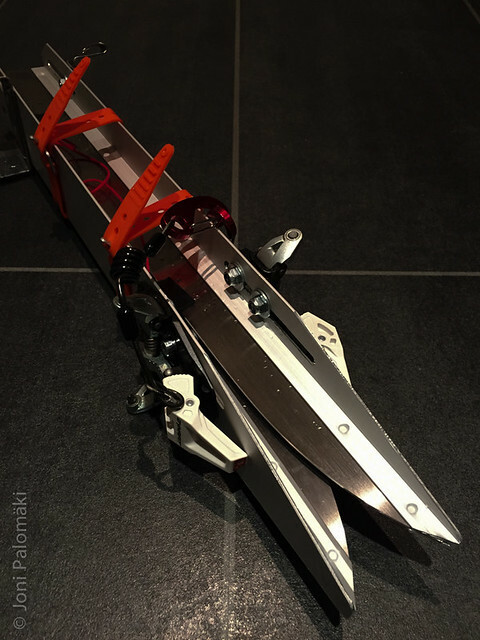 Not many stores sell those separately, and Skimo has a good range of models to choose from. The bindings I have are Dynafit Speed Turn, a classic entry-level model, perfectly fit for this purpose. All Dynafit bindings are step-in and come with release mechanism which could turn out to be a knee-saver and the rest, such as the crampon clip, is irrelevant. Speed Turn weighs 157 grams each, and while the race versions are even lighter, down to 78 grams each, the difference is negligible considering the total weight with boots somewhere around 1 - 1.5 kg each. Speed Turn hole pattern is almost a perfect fit to Skyllermarks rail - a touch of file on the aluminum finished the job, and it was easy to attach the bindings securely on the exact spot I wanted. Speed Turn has actually five holes on the base plate, the fifth one being up front under the lever, right in the middle. Obviously with T-shaped skate it’s not possible to utilize this, but four is plenty in my opinion. 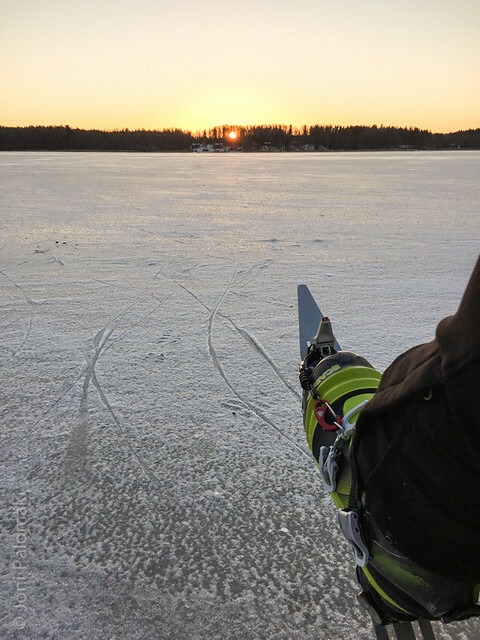 This week the sea ice had reached ample thickness to extend my testing outside of the ice rink, and on Monday I had the first run on the surprisingly smooth ice on my backdoor bay in Kivenlahti. While Dynafit, made for ski alpinism, allows free rotation around the pins, I hadn’t really made up my mind whether I prefer the heel free or locked down - I kept on the Möja heel cups to easily lock it down. 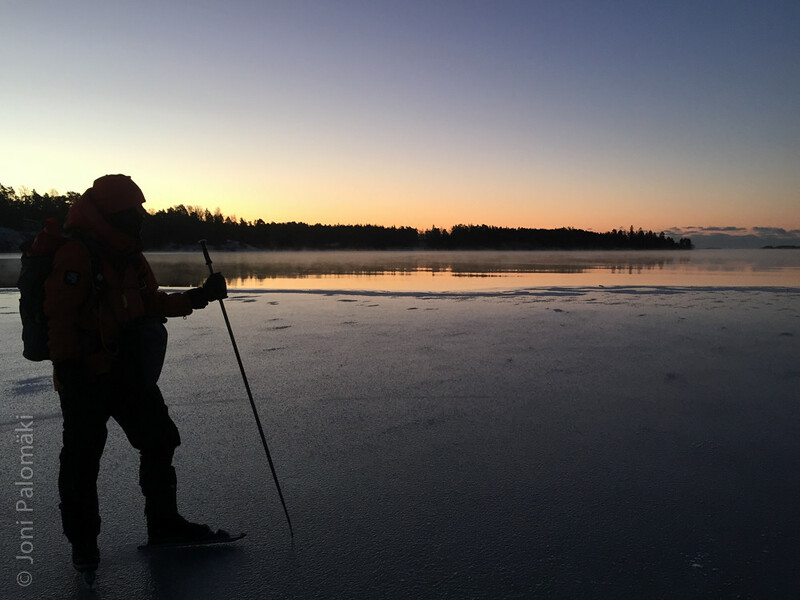 Come Tuesday and Boxing day, I headed out again, this time with Marko, on a full moon to sunrise tour around Espoonlahti. As we carried day trip gear on our backs, it was good to test the balance when keeping the heels free, and I had absolutely no issues with it. After the trip I removed the heel cups, to be carried as a spare with Möja toe piece, should the Dynafit ever fail on a tour. The tour we did extended until and around the open water line at Pentala. 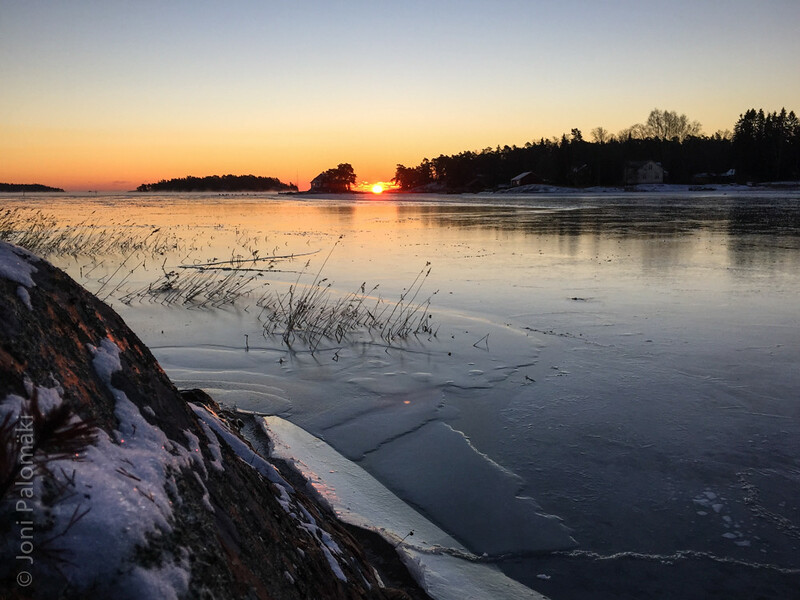 With relatively smooth ice and not much wind it was a stunning cruise first with full moon on our backs, and then enjoying a cup of coffee on an island, backlit by rising sun on the horizon. 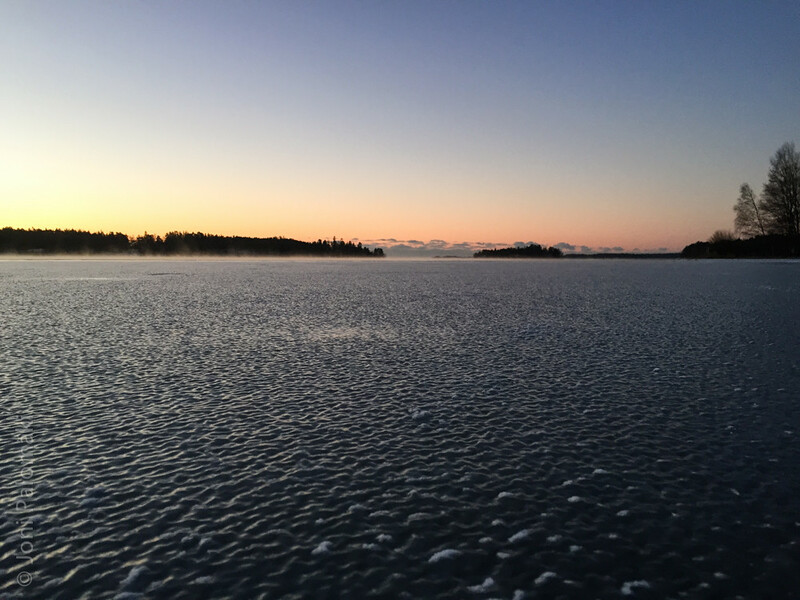 It was also an educational one, negotiating the route around an island with varying quality and thickness of ice, learning to probe and analyze. Few times we had to walk ashore to avoid an inevitable plunge. Dynafit allows quick in and out, and telemark boots are plenty comfortable to hike some distances. Verdict on this revamped setup is so far very positive. Added support and control is enough reason for me, and boots like this are toasty and more or less waterproofed for added comfort on the go. For longer tours the removable inner boots are handy, just stash them in your sleeping bag overnight. Dynafit bindings are light, simple and robust, proven many times over on demanding ski tours around the globe. The weight of the plastic boot will certainly take an extra toll on your thighs and buttocks, but at the same time will reduce fatigue on lower leg. It’s too early to make a solid statement, but it just might balance out. Further mileage will tell - looking forward to it! Today I played with my trainer kite on skates, and will be trying out the large one if the conditions hold - beefy boots will surely help also in that. 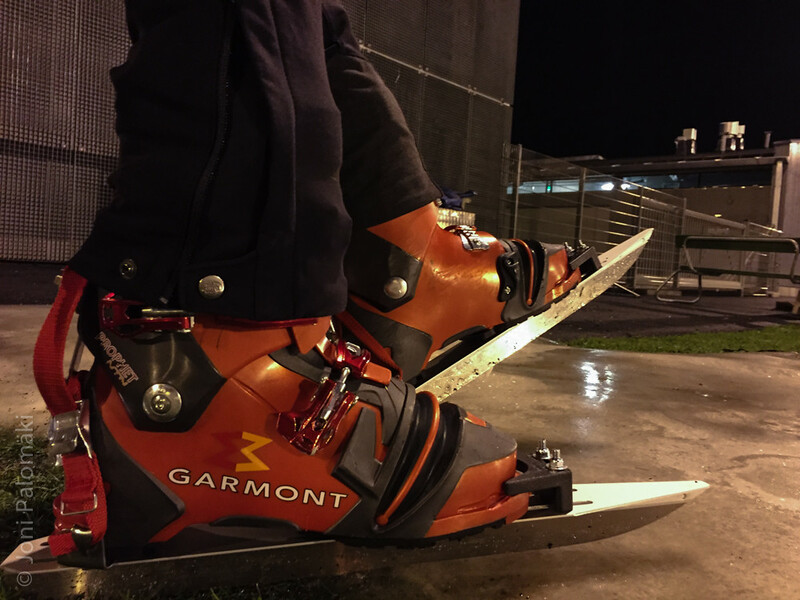 In addition to this combination, similar concept could easily be applied to a 75mm telemark boot and the Skyllermarks bindings or similar. 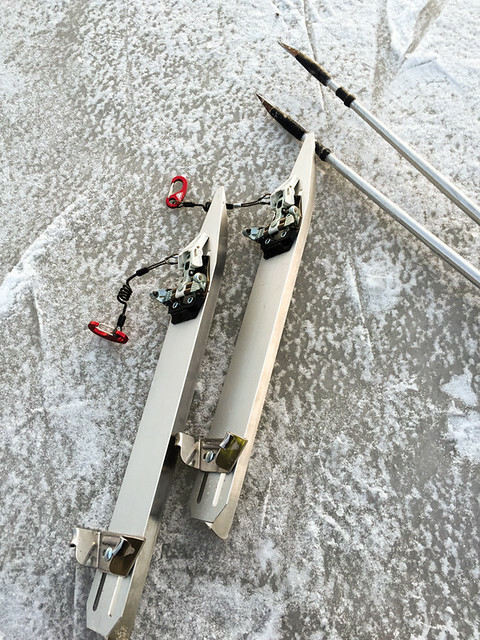 Or if you prefer your heels free, classic Rottefella Super Telemark or some other “rat-trap”, 3-pin binding should work well.